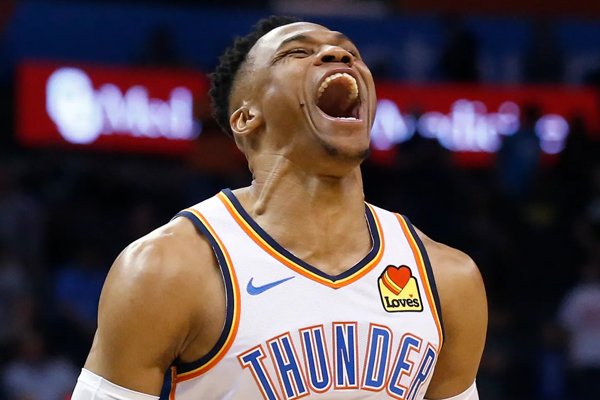 Oklahoma City Thunder’ Russell Westbrook joined the great Wilt Chamberlain by recording the NBA’s second-ever 20-20-20 game on Tuesday in a 119-103 victory over the Los Angeles Lakers. Westbrook finished with 20 points, 20 rebounds and 21 assists logging his 31st triple-double of the season. Chamberlain set the gold standard for NBA triple-doubles in 1968, with 22 points, 25 rebounds and 21 assists against the Pistons in what had for decades seemed to be one of his most unassailable feats, right up with his 50.4-point season and legendary 100-point game. After secure the record, Westbrook could be seen mouthing “that’s for Nipsey” to the fans as a tribute to fallen rapper Nipsey Hussle, who was shot to death outside his clothing store in Los Angeles on Sunday afternoon. To put Westbrook’s achievement into further perspective, there had only been 45 games of even 15/15/15 in NBA history entering Tuesday’s action, including seven by him. Westbrook is closing in on averaging a triple-double for a third consecutive season, and no other player has done that multiple times. He needs just three assists to solidify his numbers.